Every year many people visit this tourist location in the United States of America. 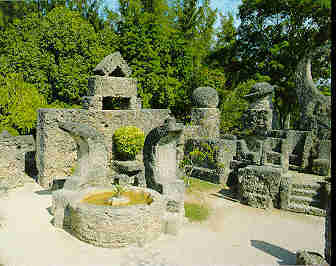 Here is some information about the Coral Castle about , but I can't tell how you how he built because no one knows. But when you look at what he was doing, you can see that part was dealing with astronomy. 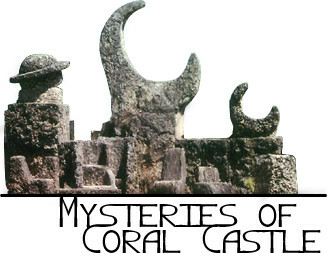 And since coral is fairly easy to carve, the shapes that result don't really surprise me, but 'HOW' they were moved? 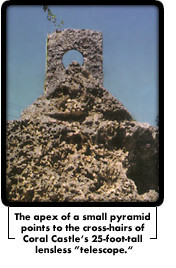 "Entrance is made through a gate fashioned from a single coral block weighing nine tons. This miraculous monolith is approximately 80 inches wide, 92 inches tall, and 21 inches thick. It fits within a quarter of an inch of the walls on either side and pivots through an iron rod resting on an automobile gear. The enormous block balances so perfectly on its center of gravity that a visitor can easily push it open with one finger. Modern construction engineers are at a loss to explain how such a ponderous object could have been set with such a high level of precision. Another gate, this one a great triangle, at the opposite wall, weighs three tons." Did a Latvian immigrant rediscover the secrets to the building of the pyramids... of levitation... of anti-gravity? His amazing "castle" may hold clues to long-lost powers. In 'Brain-Storming' you are NOT allowed to exclude any idea on what has happened, and it is apparent that Ed figured out how to counter the effects of gravity. Discounting all rumors and going ONLY on what Ed has provided, you can see that he did SOMETHING to counter gravity. Consider what Keely, Searl, and Tesla have to say about the nature of the universe, and using broad terms you can see that a 'simple' force was at work, and that Magnetic forces where used. Why? Because any person will give you a clue to the secret that lies behind how they did it. They will not give you the secret, but they will talk about it. Ed, Tesla, and Searl talk about magnets, but do not understand how they worked. Keely talked about vibration. Consider that Ed was a simple but well read man, and not the most advanced scholar. Consider that what he did was back in 1920. Technology was not that advanced at that time. He talks about 'copper wire', and DC. He states 'emphatically' that Science is wrong about electricity. That he knows the 'secret' of how the pyramids of Egypt were built. That all matter consists of 'magnets'. That electricity is not a one-pole phenomenon, but that each pole has a separate and distinctive effect on iron. That magnets jump differently from iron and copper. That magnet's are a perpetual motion machine. So what did he discover? I don't know, but I know this, that if you take two bar magnets North, to North and place them in a tube. Mark the position that the top magnet is elevated in the tube, and wait 10 years that they will STILL be in the same position. Where did the 'energy' come from to keep that top magnet elevated? It has a weight, a mass, and is opposing the force of gravity for many years. If I replace the bottom magnet with an electromagnet, and elevated the top magnet to the same position, I could calculate the amount of energy used by the electromagnet. So where did the energy come from? According to Ed Leedskalnin, and others, it did not come from anywhere. Recently there has been effects from supper magnets that cause a form of cancellation of gravity without effecting the object (mouse, etc). Could it be that the lower permanent magnet suspends the effect of gravity? Could what Ed Leedskalnin said, that all matter is held together by magnets be partially correct? If we could cancel out the gravitational effect would that mean that we were creating energy to hold up the magnet, or would it mean that we didn't create energy, but instead didn't need it. Lets presume that Ed was right, and that every atom has a pole. How could we guide the poles in such a manner that they would not be pulling (north to south) to the earth? Extrapolating the reasoning, it would make sense that the heavier the object, the more random the placement of the poles, and therefore, the more attraction that would take place. Since Ed also said that each electron and each Proton was a 'seperate' magnet it would also make sense that the more magnets there are, the more chances there are of attracting one to another. Since Keely talked about using 'Hydrogen' to counter the effect of gravity, and that he knew the 'frequency' of each atom, (jump is stream of conciousness) maybe it would be similar to crystals, and the music of the sphere's. Maybe it is an alignment of the crystalline structure of matter, and the effect that we see AS the countering of gravity, is nothing more than a canceling of gravity. It would explain why so little energy is needed. It could also explain why Keely used 'hydrogen' as it would be the simplist to manipulate. Ed did it by playing with copper wire, and trying different things that occurred to him and being observant. Sounds just like what Edison would have done. Ed's writings were simple, and didn't really counter much of what I would consider 'common' science, but it seems he extended the realm of knowledge in how to make his principle operate so that he could move 30 Tons of rock by himself. I honestly think that the cutting of the rock would have been the hardest part of the operation, and the most 'time' consuming. So how does extending a positive, and negative current made of magnets, and every atom having a north and south magnetic pole open up possibilities to move and place a 9 Ton gate? Ed Leedskalnin also put out a small booklet (circa about 1945 reproduced below at) on his theory of how electro magnetism and magnetism worked,a lot of people looked at his explanations but found it difficult to understand. maybe if you read it fully you see something that others have not. if this webpage interested you then these following pages might also be of interest to you. The pryamid may have been one giant water pump see the reason this author thinks so.